Sophisticated, Romantic, Elegant and Old World Charm are just a few words that describe our Main Dining Room. The heart and soul of Chez Francois will always be the Main Dining Room and for Special Occasions, there is no finer restaurant in Ohio. 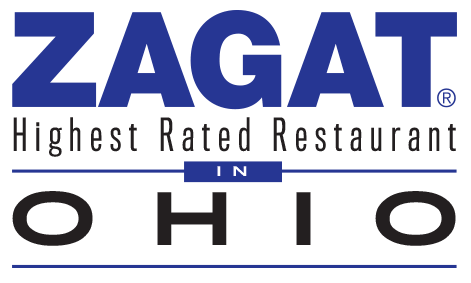 Once again we are delighted to be the highest rated Zagat restaurant in Ohio. 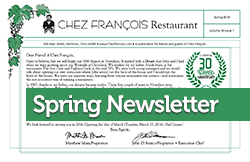 Additionally, Chez François was chosen as one of OpenTable’s 2015 Top 100 restaurants in America. Our Wine List received the “Best of Award of Excellence” from The Wine Spectator for 2015, one of just 973 worldwide. 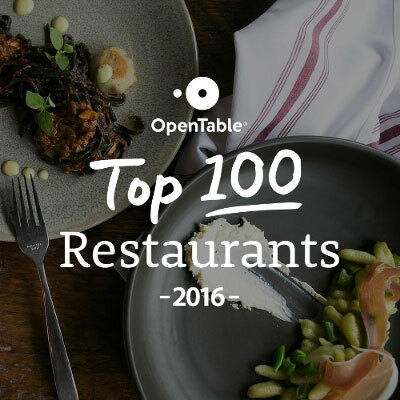 The results are in for the OpenTable 2015 Diners’ Choice Top 100 Restaurants in America. 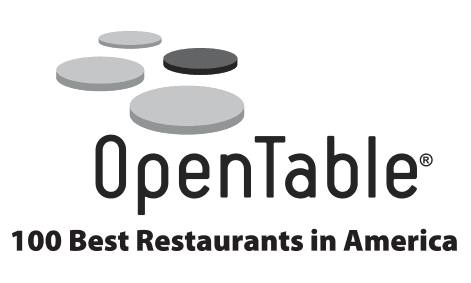 OpenTable determined the list of honorees after analyzing more than five million reviews of nearly 40,000 restaurants across the country! Thank You! We are humbled by your kind words. Thanks to our loyal patrons Chez François cracked OpenTable’s Top 100 Most Romantic Restaurants in 2015. We graciously thank you! Casual, yet sophisticated, one can imagine themselves anywhere in the world while dining outdoors at the Riverfront Café. Twenty-eight years later we have refined outdoor fine dining to a science. The menu is the same as indoors with a few additional light meals. We always take reservations and have three adjacent docks available for your boat. The Vermilion Public Boat docks are located next to the restaurant and offer overnight accomodations, electricity and water. (440) 967-7087. Our Martini/Wine Bar is a popular gathering place for locals and visitors passing through Harbourtown. Guests love Touché because it’s casual, impromptu (no reservation needed), comfortable, and offers small plates and entrees of delectable cuisine. Touché offers twenty wines by the glass, a great collection of hand-crafted beers from around the world, well-made martinis and great sipping whiskeys (Single Malt Scotch & Bourbon), tequilas and rums. The Parisian Room has evolved into a room with a purpose, where the purpose changes with each special event and is always different. From 50th birthday parties, to fundraising events, to baby showers, there is no formal menu or restrictions. We always cater to your needs and budget. We are always honored when patrons entrust us with their special occasion. It drives us and gives us purpose.